As a Henley family of 8 generations we provide a unique view on Henley. We share old photos/postcards and more recent photos, provide local weather information, and blog to the world about Henley. If you're not sure where to start you can choose from our short list below or just dive in and go somewhere random. If you have a Henley event to promote, a Henley business to advertise or wish to contribute to our website then why not contact us with your information, suggestions or thoughts. What do you want to do? I'd like to… …the most popular photos. …the least popular photos. …recently added photos. …a random photo (adding a comment?) …a random old photo/postcard (adding a comment?) --> …out what the weather's going to be. …a local business. …a local church. …a local walk. …visitor information (with FAQ). …by playing our game. …by reading and commenting on our blog. …by contacting us. …by commenting on a photo. 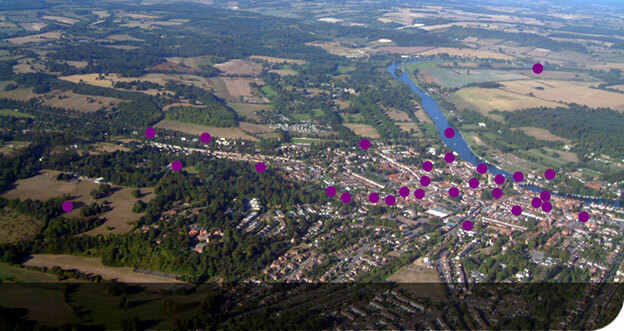 …by commenting on an old photo/postcard.--> …aerial photos of Henley. Sorry, no forecast available for today as we're a little busy. Please come back soon. Please hover over a spot to see information about the selected area. Click spot to view photos.